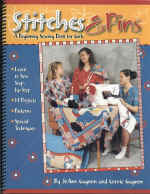 From plugging in the sewing machine to creating a pair of pajamas, Stitches and Pins guides the novice seamstress with clear, step-by-step instructions. 14 Projects complete with patterns, are useful items the seamstress will be proud to use, wear, or give. Pillowcases, potholders, tote bags, doll blankets, vests: each project focuses on mastering specific techniques, and builds upon skills learned. Apparel patterns are for girl sizes 8 to 16. Special techniques beyond the basics -- such as bias tape finished edges, quilting, and embellishments -- ensure that the final creation will be as professionally constructed as it was fun to make. "This what I have been looking for for years. Its real garment construction for kids!" Beverly L. Adams-Gordon, author of Spelling Power and Writing Power -- who has sewn for 35 years.